Are you like me, living in an apartment and desperate for a home office? Do you work a lot at home or work full time at home? Have you found yourself standing in the doorway of a spare closet and day dreaming how to make better use of it. Well, I have. 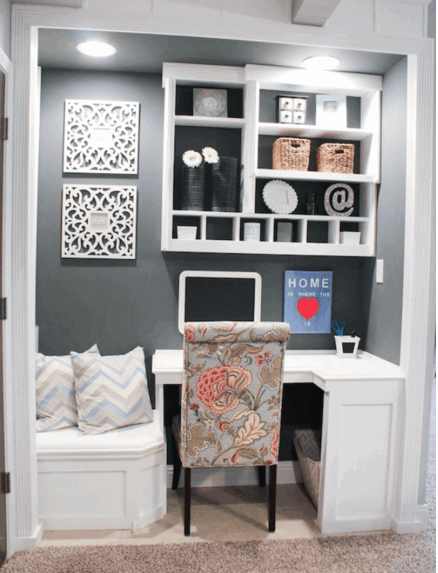 One option is to make that poorly or under-used closet a home office closet. I had once before removed the folding doors from a closet to a second bedroom and used it as an office. It was, however, very utilitarian, not very inviting and worse very disorganized. 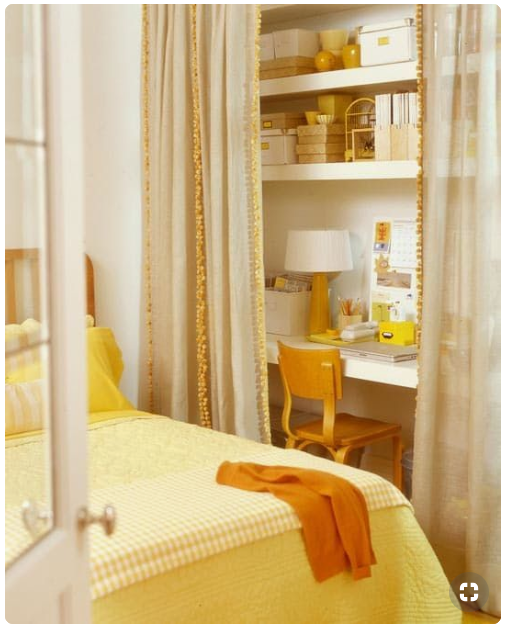 This time I want something really cool and inviting--and well organized! 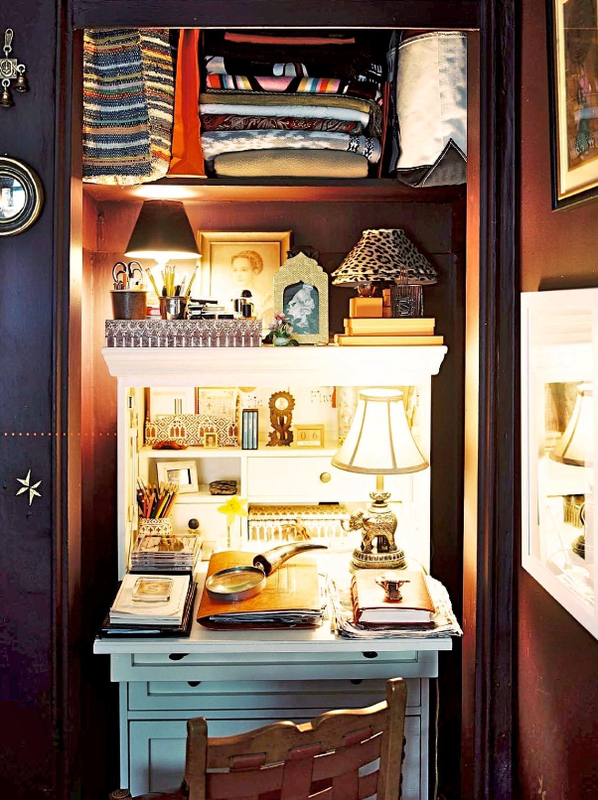 Here's what I'll need to consider a closet office. How about you? 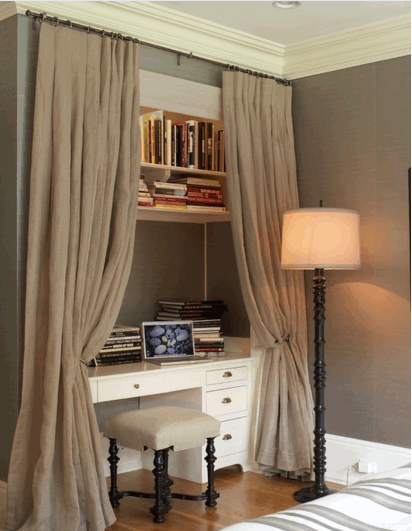 Hide the closet office or not: take the door off or leave it on; leave the door open or add drapes. And that's where the search for ideas for a closet office began. Here are some illustrations I found. 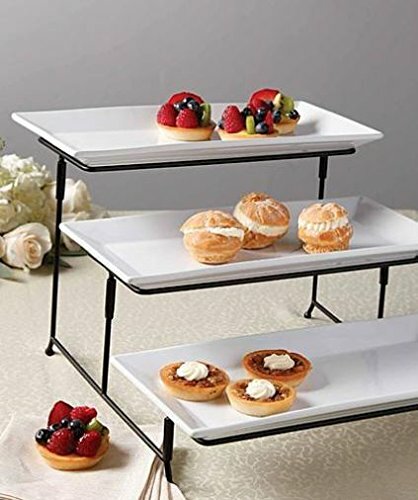 Exquisite and functional! The clothes storage and office comination is so well done. Admittedly, reaching for clothes stored so high up is problematic for the not-so-tall people. But it's a great idea for storing off-season clothes. I'm a sucker for cool and that's what I think about this office in a closet. 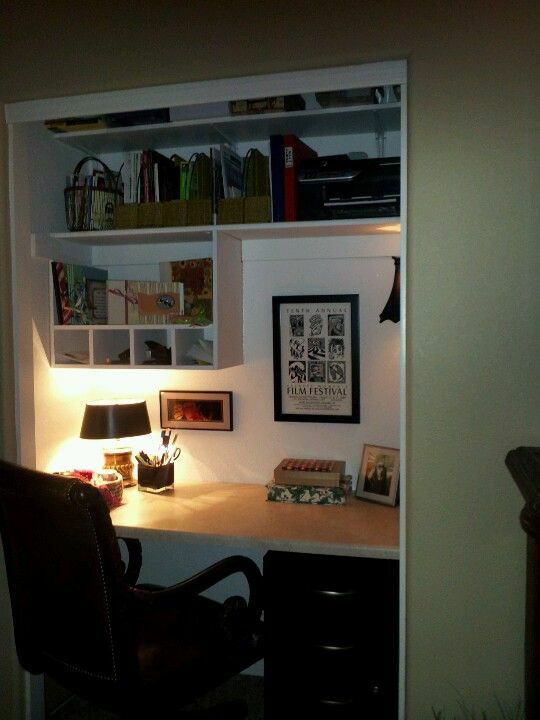 A traditional style desk armoire was placed in a closet. Top shelves are used for storage while the desk armoire holds all the user's lovely collection items. Small lamps offer task lighting and give it a cozy feel. It looks like the walls are paneled and the shelves are wood. However, the scheme could easily be adopted in other design styles. Hide it or not: take the door(s) off and leave it open; take the door(s) off and add drapes; or just keep the door(s) on and close the door(s) when the office is not in use. 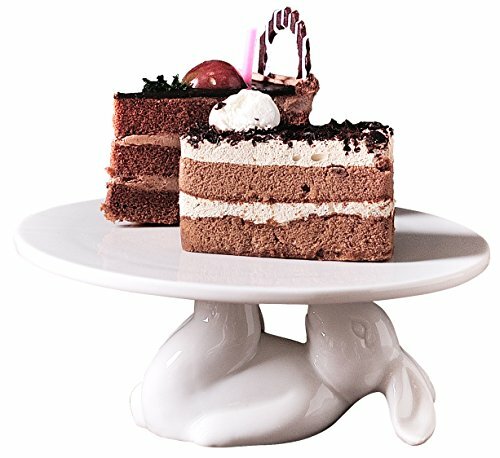 How much shelving and file cabinet space is available? Closets most generally have an overhead light. However, this is general lighting and can be rather harsh. Adding task lighting like desk top lamps not only focuses the lighting but can also make the closet office feel cozy and very private. 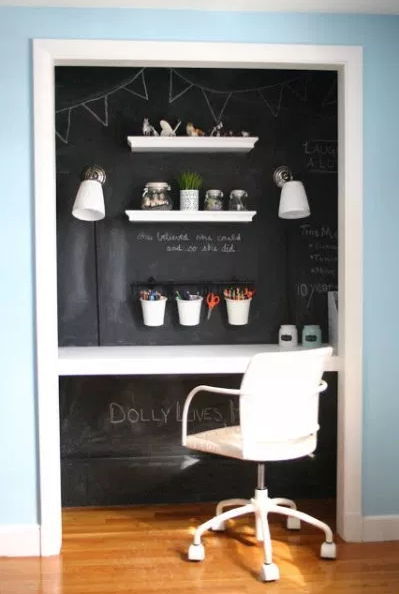 Finally, and most important, how to budget to create an office in a closet is a critical consideration. I'll be taking the approach to create a plan that reflects what I can do myself and what needs to be purchased. What's the primary function for the closet office: a place to pay bills, a place to work on hobbies, a craft, a to place study or just do computer work. What and how much storage space is needed. Will electrical work be needed. Remember, it's easy to simply use extention cordes to connect eletrical appliances and wi-fi could resolve needed internet connections. New furniture, shop at consignment stores or both. Or just move furnishings from other parts of the living space. 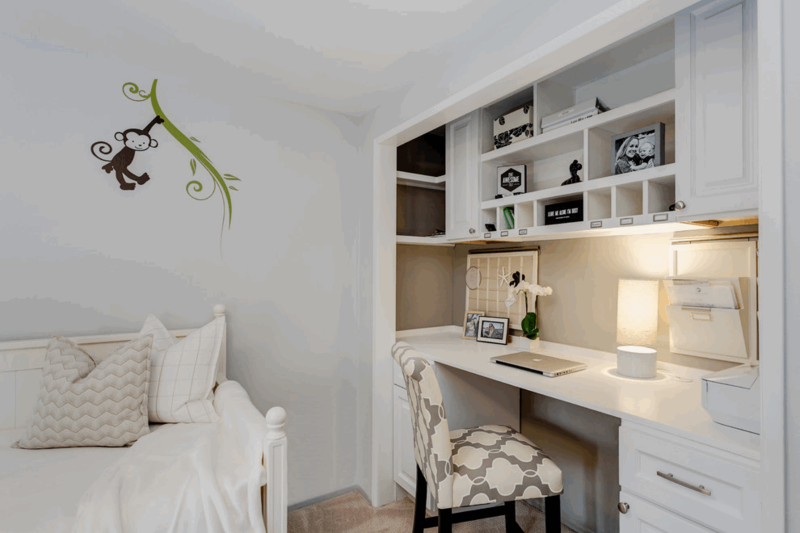 Every inch of space in small space living is valuable. 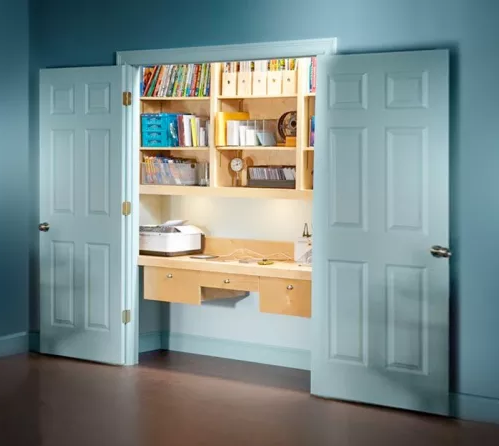 One way of making the most of the space, if there is spare closet is to convert it to an office or a storage/office space. But before jumping into such a special project consider its budget, design and how space is available. In addition to this, it really is important to determine exactly how the closet offic will be used. If it's meant to be business or study or desk-top hobby space, then use it that way. It could become a disappoint or expensive if it needs to be converted to a different function. Storage Bench Seats Are Really Cool! Here's Why. Is Your Apartment Storage Space Hiding From You? This post is updated and moved from the January 2016 'annsliees' blog.